Before she was Captain Marvel, she was Ms Marvel! NASA Security Chief Carol Danvers’ life had long been intertwined with the alien Kree and their Earthbound soldier Mar-Vell, and soon she gained incredible powers of her own — and a colorful persona to go with it! Now, as editor of Woman magazine, Danvers must contend with Marvel’s biggest blowhard, J. Jonah Jameson, while coming to terms with her brand-new life as a super hero! 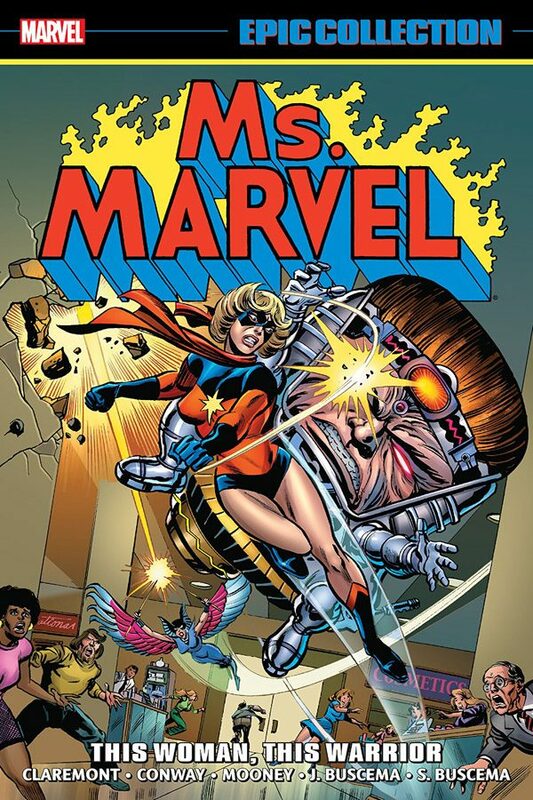 As Ms Marvel, Carol faces down threats including the Scorpion, the Doomsday Man, Grotesk and M.O.D.O.K. — but her deadliest foe of all may be the dynamic Deathbird! Plus: Ms Marvel fights alongside Spider-Man in battle with the Super-Skrull! And will she join the dynamic Defenders? Relive the early days of your favorite hero! Collecting Ms Marvel (1977) #1-14, Marvel Team-Up (1972) #61-62, Defenders (1972) #57.